I was serving in the Royal Air Force in 1996 when I was posted from Norfolk to Bath. In Bath, there were only a couple of light blue jobs, working alongside the Royal Navy and the Army, so I didn’t expect to stay in the West Country for more than a couple of years. Initially, I lived in Chippenham, but on being re-toured in 1999, I bought Hill Cote, an older property sited at the top of Box Hill. My elderly parents were concerned that I had bought a property that needed a lot of tender loving care, but they shared my enthusiasm when they saw the uninterrupted views from Hill Cote across the valley to Colerne, or looking right towards Rudloe or left towards Bath. The early history of the area is obscure but we can trace families who lived in the Box Hill area through the censuses of the ecclesiastical parish of St Thomas a Becket, Box. As we shall see members of these families appear to have later taken up residence in Hill Cote and Ivy Cottage. The 1881 census recorded that David & Mary Sheppard lived on Quarry Hill with their son, Walter (born about 1868 who was a scholar aged about 14). Twenty years later the census showed that Walter Sheppard lived on Box Hill but there was still no house name. He was a quarryman labourer (aged 32) and his wife, Sarah, was 36. They had two children living with them: Tom, their son, aged 5, and Florence, their niece, 10 years. In 1901 David Milsom (aged 38 born about 1863) lived at the Rising Sun where he was recorded as a licensed victualler. He lived with his sister Harriet (40), housekeeper, and his sister Ann (56) who was a cook. The 1911 census recorded David Milsom still living at the Rising Sun with his wife Georgie, aged 41. He was listed as an innkeeper and brewer. They lived with their children David (aged 5, born in Box), Una Mary (aged 1 also born in Box) and Hilly Griffin aged 27, who was born in Corsham. In its current guise, Ivy Cottage was built in the 1950s but there must have been a former incarnation of the house as it was mentioned in the 1911 census when Walter Sheppard, his wife, Sarah, and Tom Sheppard, apprentice, lived there. Also there was Mary Sheppard, who could have been a sister or the mother of Walter, born in Sutton Venney, Wiltshire. The new Ivy Cottage was built by a builder called Mr Taylor in 1954. The house was constructed on a concrete platform so that it could ride out any slight movement of the subsoil. Joan and Charles Woodgate bought the house prior to its completion and lived there together with their three young children, Elaine, Hilary and John and later two further sons, Richard and Peter. 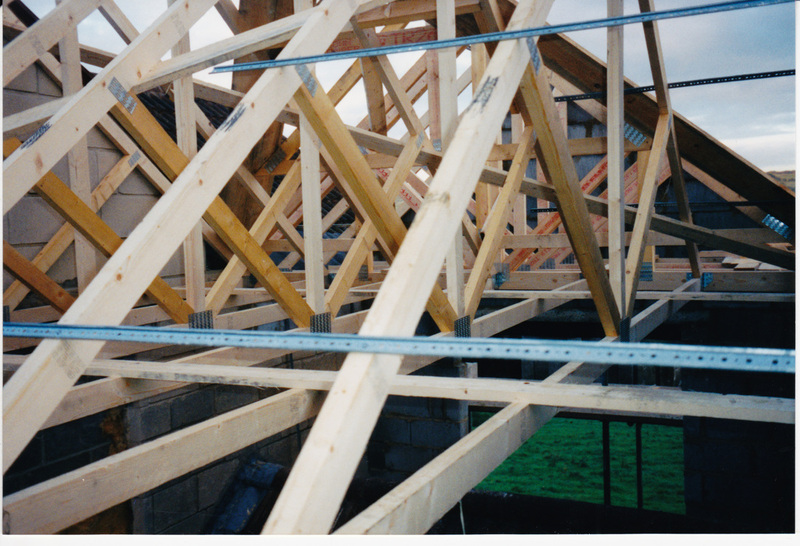 Charles was a specialist engineer and became the regional technical representative for a Midlands company. He was one of the first people on the scene of the Rising Sun explosion in 1957 and his work colleague subsequently married Barbara Davies who survived the disaster. Parties at Ivy Cottage: Above left: Woodgate family in 1955 and above right: children's party in 1957 (photos courtesy Elaine Lofthouse). If you are one of the girls in the party seen above right we would love to hear from you. Charles and Joan were actively involved in village life throughout their 60 years on Box Hill. Charles was a very keen photographer and both he and Joan took a great interest in the local natural history. They were great supporters of the Box Archaeological and Natural History Society and involved in several hedgerow surveys, meticulously recording the useful data. 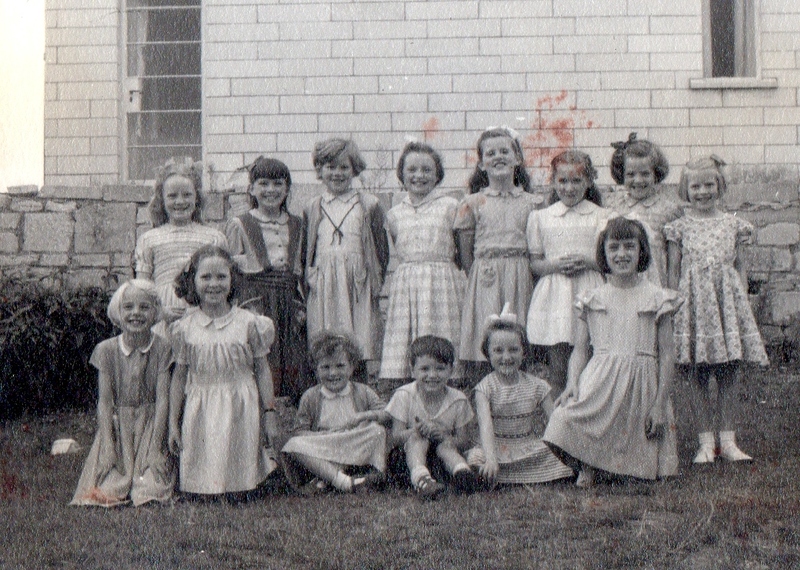 All the Woodgate children went to Box School in the years between 1954 and 1975 and during the early 1960s they often played cricket or football with other local children on the main A4 road during quiet evenings – imagine that today! Ivy Cottage was the Woodgate family home until Joan moved out in 2012 to live near her elder daughter, Elaine in Dorset. Joan sold Ivy Cottage to Mark and Joan Rodgers. Nowadays there is no house called Clare Cottage, it has vanished completely but it is mentioned in the records. 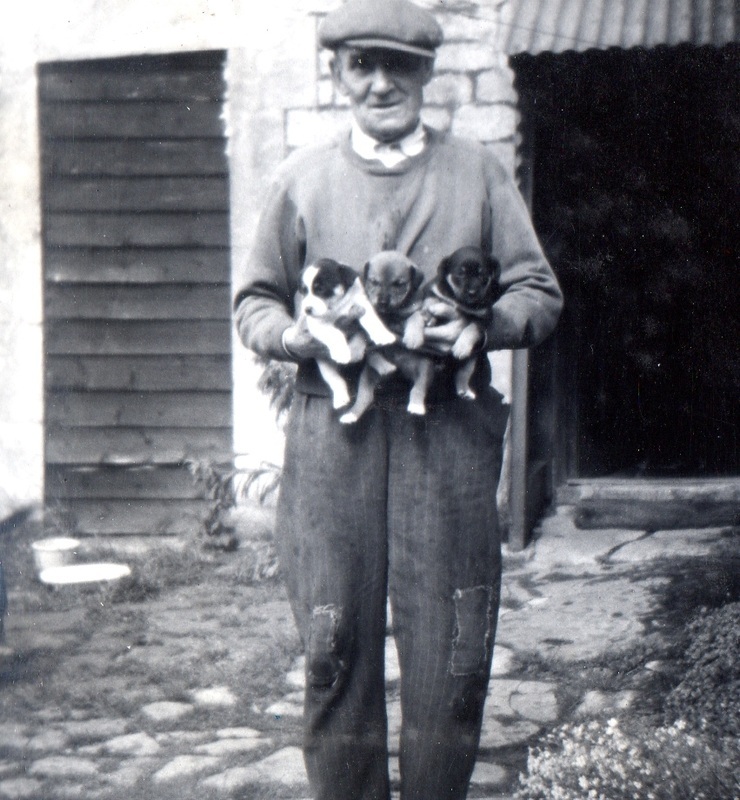 The 1911 census recorded that John Fell Jones, a baker, was living in Clare Cottage. He was aged 32 and had been born in Gloucester. At the time of the census, he had been married for nine years to Gertrude Ada (aged 29) and they had three sons, Herbert George (6), Tom William (5) and Stanley Perrin (2), all born in Chippenham. John Fell Jones didn't stay there long as in 1915 he was recorded as living at 5 Audley Road, Chippenham, when he enlisted into the Duke of Edinburgh’s (Wiltshire) Regiment. It is probable that Clare Cottage was a cottage on the current Hill Cote site. I believe that Georgie Alberta Elizabeth Milsom lived at Hill Cote adjacent to the Rising Sun. 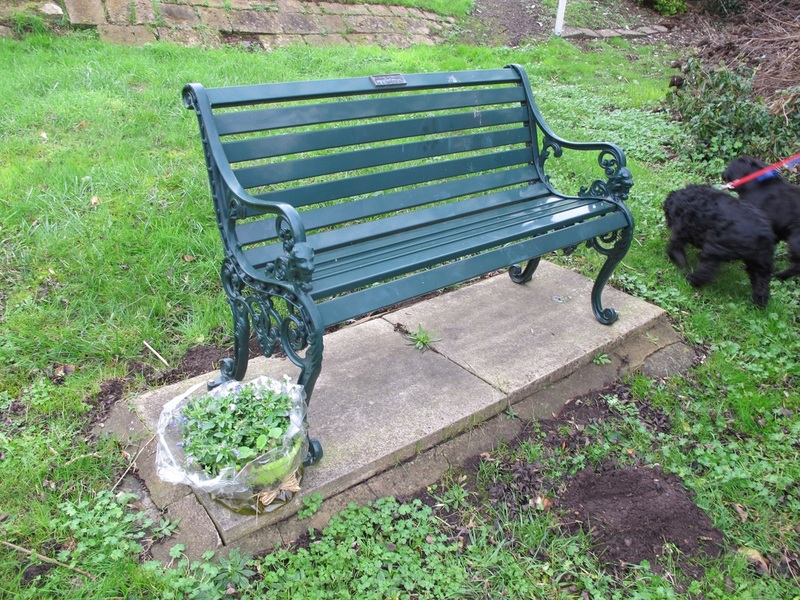 There is conveyance dated 1 March 1927 for the use of a drain (built by the licensee) to a cesspit and filter bed in Quarr Close for five shillings per annum. This was between the Bristol Brewery and Georgia Alberta Elizabeth Milsom of Clare Cottage, Box, adjacent to Rising Sun and licensee of the drain. It is likely that Clare Cottage was later rebuilt and became Hill Cote. The property changed hands several times in the inter-war years. On 1 November 1930, it was sold to William Charles and Mary Elizabeth Bradfield of Jureland, Bathampton for the sum of £400 by John Clemence Turner, of London, solicitor of D Milsom, who had died on 27 December 1925. The Bradfields subsequently took a mortgage over Hill Cote of £400 from Geoffrey Hignett (Gentleman) of Southstoke, Somerset. William Bradfield died at Hill Cote on 6 October 1932 and in February 1934, it was sold by Mary Bradfield to Miss Frances Isabel Rowlands of Ketton Stamford, Lincolnshire for the sum of £525. On 18 September 1954, Miss FI Rowlands in turn sold it to Mr Walter Hodgson for £200; that seemed quite a loss for the Rowlands or a bargain for Mr Hodgson! Later in 1954, Mr Hodgson wrote to The Bristol Brewery stating he had taken over Hill Cote from Miss Agnes Helen Rowlands and duly forwarded 5s for the annual rent on the drain in Quarr Close. Walter Hodgson lived in the house from October 1954 with his disabled adult son, Sidney. Sidney did not have the use of his legs and had to shuffle around or use a hand-propelled invalid carriage. Mr Hodgson always seemed an old man to the children in Ivy Cottage. He died possibly after moving to be near his other son, also Walter. Charles Woodgate purchased Hill Cote in 1971 from Walter Hodgson junior. The house was virtually derelict but planning permission was refused, so the Woodgates used the premises as a store and grassed over the majority of the garden. 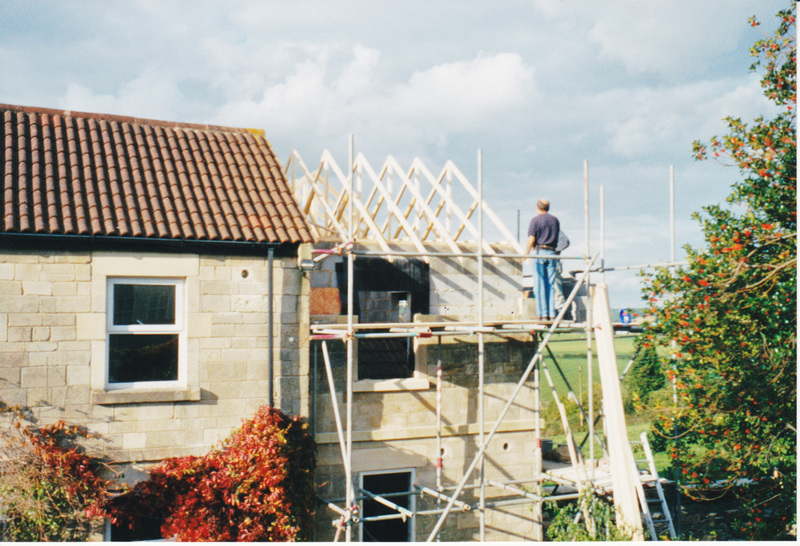 In November 1982, there was a successful application for erection of extensions to the cottage for residential use. On 10 December 1982, Mrs DE Smallman bought Hill Cote for £9,500 for her son Clem Smallman. It was he who rebuilt the property. He was listed in the electoral records as Clement Smallman and his address as 9 Holland Road, Grosvenor, Bath. I think Clem undertook a huge amount of work on the house turning it from an uninhabitable property to a house. The photographs below show just how much he achieved and the conditions under which he laboured. The work was not easy sailing, though. 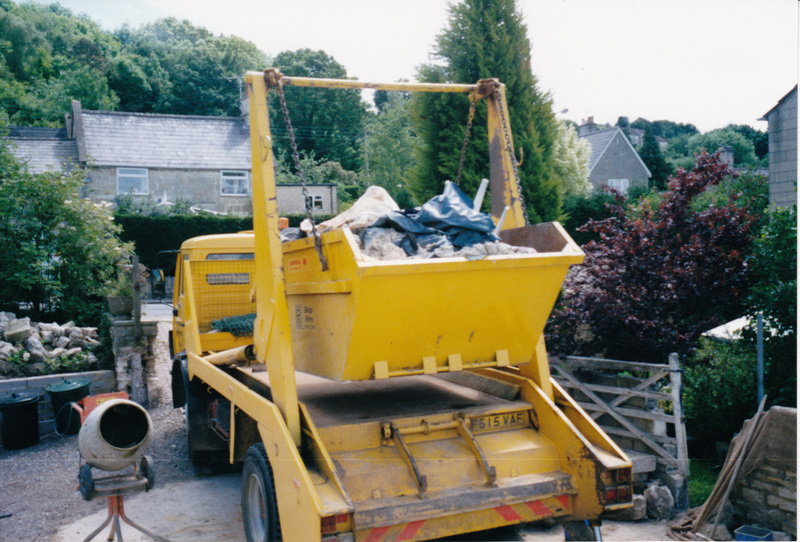 In August 1983 an Enforcement Notice was served on him by North Wiltshire District Council (NWDC) for breach of planning controls. The Woodgates gave full support to Clem Smallman’s appeal. 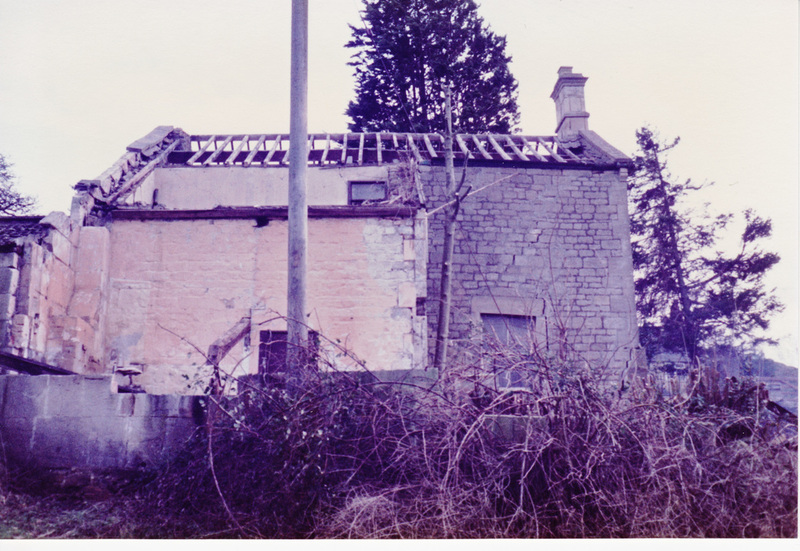 In March 1984, the Department of the Environment (DoE) viewed the property in the throes of work and opined that what remained could be called a dwelling house, even though a substantial part of the original was no longer intact. 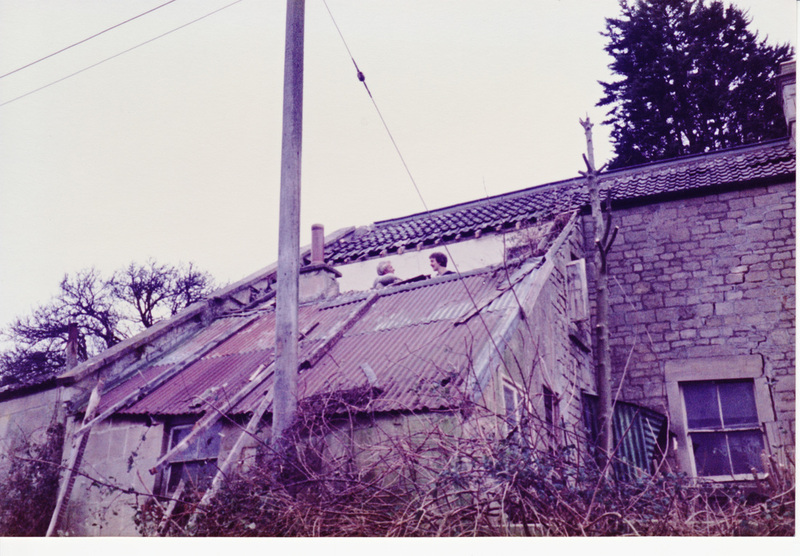 The DoE gave decision in May 1984 that what had been demolished had been necessary and that construction to date did accord with the planning permission granted by NWDC. Therefore, no breach of planning permission was further enforced. 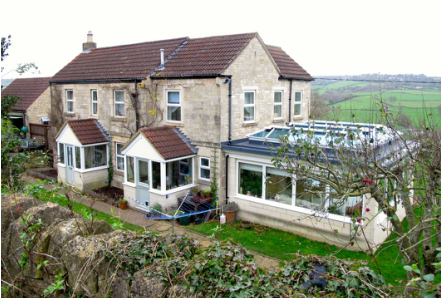 On completion the one storey outbuildings had been incorporated into the house and themselves converted into 2 storey gables with views over the valley. 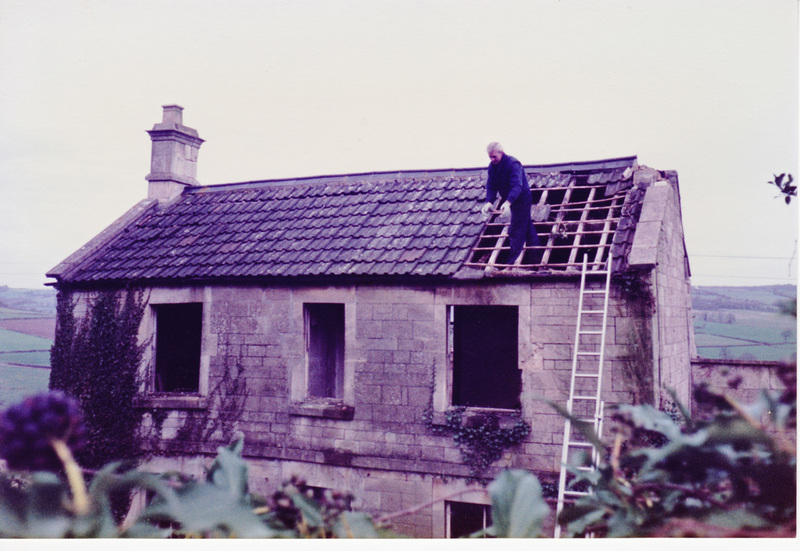 Starting work in the first restoration: Above: Clem Smallman begins work in 1983. 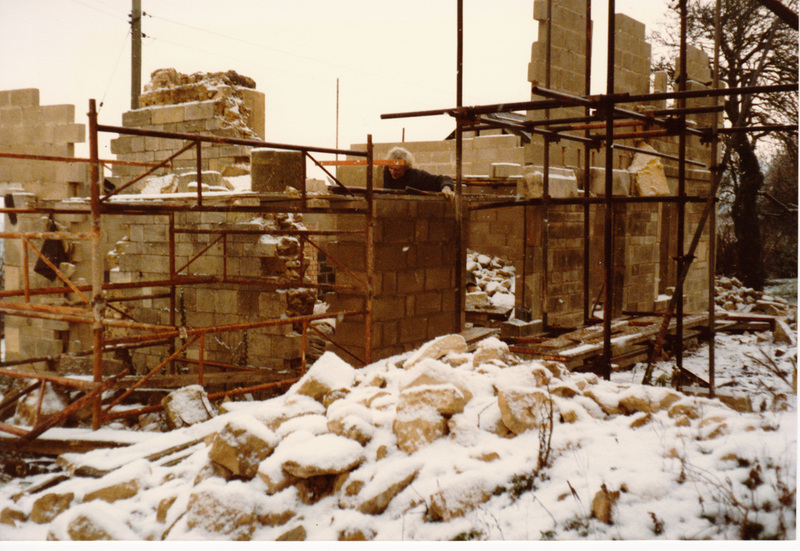 Below: Snow in the winter of 1985-86 severely hampered progress in rebuilding the walls. The name Hill Cott probably became Hill Cote in 1983-84, when it was owned by Clem, in correspondence with Department of Environment & Transport and NWDC. I understand the spelling alteration was just a typo at one of these agencies. Also early references to Hill Cott make it likely it was simply a shortening of Cottage. Anyway, now the Royal Mail calls it Hillcote as their sorting machines would like to do away with gaps in names (and counties too)! I have kept to the name Hill Cote for much of this article for simplicity. The restoration work was mostly completed by the end of the 1980s. 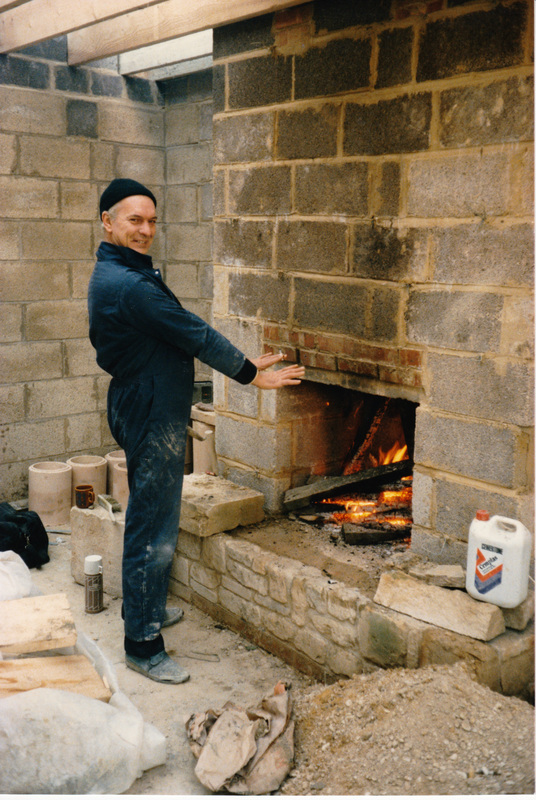 Pictured left: Making a hearth in the house in 1987 and above: the building complete but more work need on landscaping in 1988. By the end of the 1980s the house had been substantially restored into a home. But, after doing so much of the work himself, for personal reasons Clem decided not to live there and he moved away to Bristol. I bought Hill Cote from Peter and Linda Woodgate in April 2000. Peter’s parents, Charles and Joan, still lived at Ivy Cottage. Peter bought Hill Cote in May 1993 when it was in a terrible state. Although Clem and his partner Barbara had been living there, it was not really in a habitable condition, still more like a building site! Peter had been a freelance sound engineer, but he sold up to emigrate to New Zealand where he still lives with his wife, Linda. In 2000, during the conveyancing from the Woodgates to me, a legal variation to the common boundary dividing the two houses was made in March 2000. At some juncture when the Woodgates had ownership of both properties, the outside wash house from Hill Cote had been absorbed into Ivy Cottage, where an adjacent wash house stood. This legally corrected something that had been changed by practice over the years. When Peter and Linda Woodgate bought Hill Cote and made it their home, they configured the original two up and two down, with the addition of two 2-storey gables where the single storey outbuildings had once stood into a one bedroomed house, with an adjacent dressing room and an upstairs office. That obviously met their needs as a couple. Typically RAF, I couldn’t leave it alone and so I made plans to re-configure it into something more family-friendly. Firstly, I needed somewhere to unpack tools and building materials as the house only had a wooden shed and that was quickly descending into chaos as I rooted about searching for hammers and nails! So I submitted a planning application for a garage and to extend the house to give another bathroom and a couple of extra bedrooms. In parallel, the office and the dressing room were being converted into two more bedrooms. 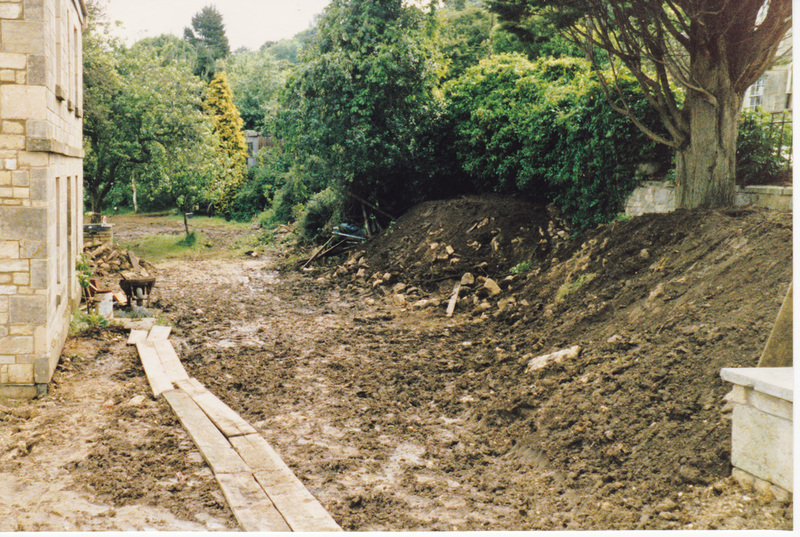 The raft that was a vehicle hardstanding was too narrow to accommodate a double garage, so extra footings had to be dug to allow the widening process. We needed to find undisturbed ground or rock, before the Building Inspector would allow the concrete to be poured. And bingo! Just when the digger was at full stretch we found a flag stone floor and evidence of a doorway into the field (Quarr Close). There had obviously been a house underneath on the western edge of the plot where Hill Cote now stood. This was my Time Team moment - I just needed a camel hair brush and a dustpan to make a huge discovery. I think Hill Cote was built in the 1900s so the previous house could be 1850s or earlier. But there was little or no planning permission needed before the 1950s, so no earlier plans. Bother! Meanwhile, the ground worker said that I could spend as long as I wanted in the 8ft deep hole, but I would need to pay standing time for onlookers as there was a cement mixer standing with a full load being mixed and four labourers resting on their shovels waiting to lay the foundations. Reluctantly I climbed out and the footings were poured in. (Photo). I think that this original house was called Clare Cottage, although I am surmising this solely from census records. Soon the garage was built and work on the house could start. Meanwhile, the dry stone wall that kept the boundary between Quarr Close and my garden needed rebuilding. Quarr Close (sometimes Quar Close) is the name of the field adjacent to Hill Cote’s garden. This field was sold by Georges Bristol Brewery to Mr Fews, Mills Platt Farm, after the tragic explosion of The Rising Sun Inn. My neighbours in the valley below, the Gregorys of Salt Box Farm who now own the field, agreed a slight change to our shared boundary to smooth out the jagged line boundary that existed. 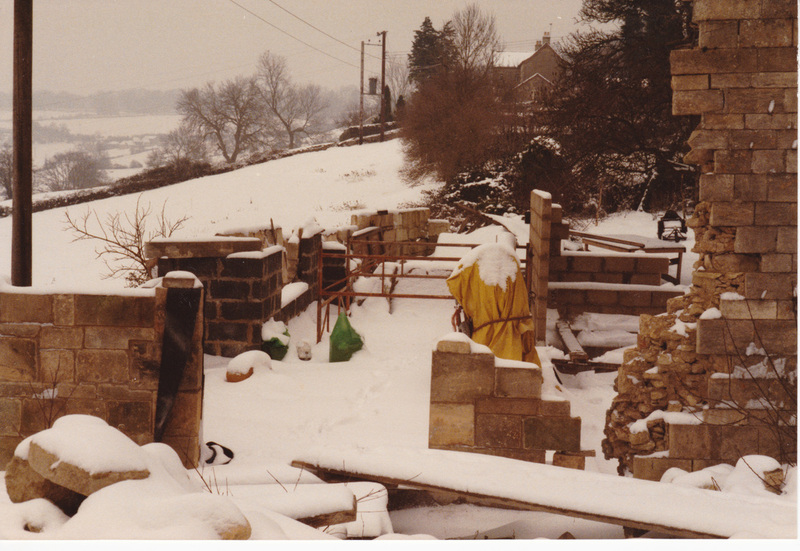 The wall was rebuilt beautifully by Basil Bye of Biddestone. Basil would regale me with stories about the valley. When he was 14, he and other boys were excused morning assembly in school so that they could work on the fields and farms for an hour or two before school. The headmaster knew that if he didn’t grant this concession, the boys would not attend school at all. He also told me that they would balance the sails on the wooden threshing machines using card from cigarette packets and that they could achieve a perfectly true and balanced set of sails. On another day, he said that he would drive the tractor (at 13 years). The clutch had a wooden block screwed to it so that he could disengage the engine whilst the men loaded stooks of hay onto the trailer. This was not a perk for the 13 year old Basil; it was simply because he was the smallest. I used to like watching Basil building the wall. He would stand there looking at the heap of stone and then bend and pick one stone up and place it immediately into the wall; this would fit perfectly. He would say, once you pick a stone up, it goes in the wall otherwise you end up with a heap of waste. Meanwhile I met the daughter of Mr Gordon Desmond Shadwell of Chippenham, the owner of the plot of land that had once been the garden of the Rising Sun. Mr Shadwell had bought the garden from Florence Emily Collier, the personal representative of Charles Samuel Collier of Grove Farm (deceased) for £1 on 19 June 1965. Mr Matthews later purchased a corner of the Rising Sun garden from the Ministry of Transport in January 1968 for £5. He subsequently used the land as an allotment for many years. When it became physically beyond him and the land had become overgrown, he gave it to Jill Matthews, his daughter and her husband Alan Shadwell. The son-in-law had been quite keen to build a house on the plot, but needed to put an access road through my garden as no direct access onto the A4 was allowed. I was not keen on this at all, but was pleased when it was agreed that I could buy it from him. He wanted a 25 year uplift included in the sale in case I changed my mind and built a house there myself. I was happy to agree to that as I had, and still have, no such intention – it is an area of outstanding natural beauty and long may it remain so. Meanwhile, I decided to widen the drive to make access easier; the planning application was granted but as it was a variation to the original application there was a whole load more fees to pay! Inside, all the partition walls of the whole of the upstairs were removed to allow a rebalancing of the space. I also wanted to keep the original windows in situ. The planning application allowed me to move the internal stairs (originally they faced the front door when it was a two up: two down. The earlier re-build had positioned them rising from east to west, but this divided the study into two parts, so I installed another staircase climbing from west to east on the back wall of the dining room. I also fiddled about with the entrance to the en suite bathroom to allow easier access and for some built in wardrobes to be installed. Over the kitchen, I built a balcony with French doors allowing guests unrestricted views across the valley from a new double bedroom, with a single bedroom to the front of the house. In 2000, I married Beryl (Bee) Bawtree (nee Fry). Her children, Matthew and Louise, lived with us and we all enjoyed Hill Cote as our home until the RAF posted me and my family to Gibraltar in 2003 for three years. That was an enjoyable time when we travelled in Morocco and Spain and enjoyed the Mediterranean climate and food! We let Hill Cote, fortunately to an American family, the Jansmas, who lived in the house until 2006. When we returned from Gibraltar I retired from the RAF and we moved back into Hill Cote and the Jansmas returned to Chicago. 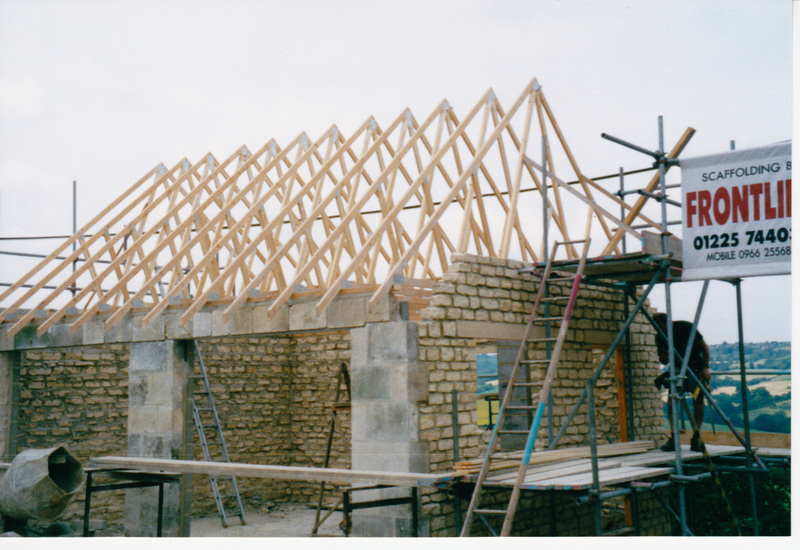 But the bug had bitten again and it was time to reconfigure the extension and the third gable to be built. The balcony was removed and the bedroom and kitchen below extended towards Quarr Close to give uninterrupted views through to Bath. I also built a large garden room that required planning permission but the 6m square metre conservatory was exempt from building regulations as it was 80% glass. The critical bit here was to end up with one level through to the kitchen to dining room and lounge. Whilst this was going on porches were added to the front and side doors. Sadly the marriage to Bee lasted only 10 years, but happily we remain good friends. Matthew and Louise both went on to university and gained their degrees. Matthew discovered motor sport and loves it. Recently, I met Ros and we formed a relationship. Happily I can say that she joined me in Hill Cote in 2014. However, the need to fiddle about with Hill Cote has stayed with me and I often sketch changes to the garages or some other part of the house. Above me a small piece of land remains largely neglected, which forms part of the Rising Sun’s plot. It is currently leased for a peppercorn rent by Box Parish Council from Wiltshire Council. The ownership is slightly muddled as the Secretary of State for Transport acquired use of part of the Rising Sun’s plot, where the pub once stood, for use as a bus stop, layby and shelter. I feel that it would be good to have a plaque marking its history and to have a passenger-friendly bus shelter rather than the dingy concrete one that is there at the moment. Then people waiting for the bus could take in the view, one of the best in Box, without having to go to a lower part and then miss the bus! 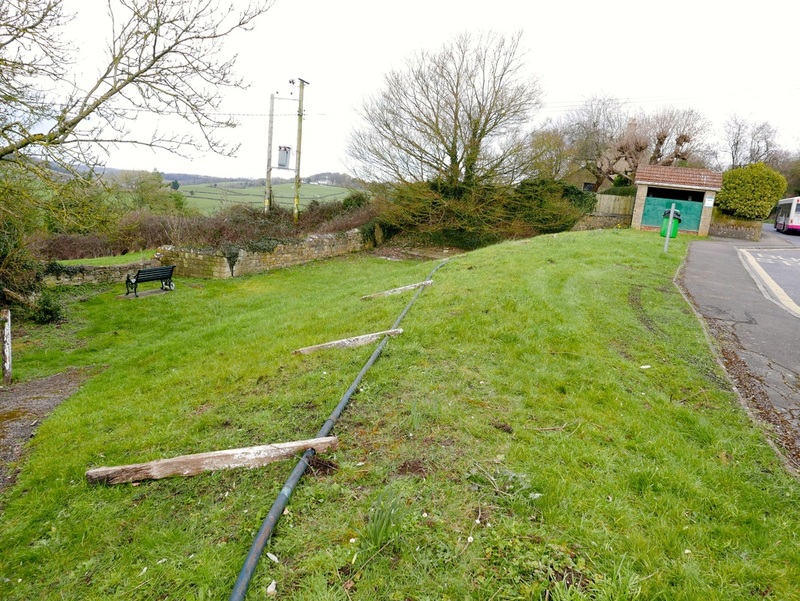 But that project needs a bit of momentum especially as it needs money to rebuild the barrier to the road and the dry stone wall onto Quarr Close. Any words of encouragement would be welcomed. Whilst we can't trace who lived in Ivy Cottage at this time we can find some named properties in the area. Nearby on Box Hill was Charles Hancock (aged 54) who was a baker and his wife Rebecca (56). Living with them was his sister in law, Harriet Holder, a widow aged 63 and Willie Hibberd a servant aged 14 years. At Brookwell Cottage lived Mark Cogswell (aged 81) who was a widower and a retired railway servant. He lived with William, his son (53), a stone mason, his daughter-in-law, Annie (aged 47) and his grandson, Percy,18 years of age, who was a stone mason. Brookwell appears to have been split into two residences and Francis George Abraham and his wife Lizzie also lived there. Meanwhile the 1911 census recorded another David Milsom, aged 54 (born about 1857) and his wife Jane (51) living at 1 Rock Cottage, Box Hill. He was a foreman ganger in a stone quarry. The story of the Griffin family is recorded at Rising Sun Early Years.